April 2015 n Performance & Hotrod Business n 73 Another factor to consider is cold crack- ing, which is the temperature at which vinyl cracks when flexed. This informa- tion is usually available on the vinyl sample cards and is something that comes into play if the item you are covering is going to be exposed to extreme cold, (i.e., snowmo- bile seats and outside equipment seating). Vinyl will typically have a backing of some type affixed to it. Vinyl can be backed with rayon, polyester or poly-fleece, with polyester being the most commonly used. Unbacked vinyl—or what is referred to as unsupported vinyl—is used primarily in thermo vacuum molded dashboards, door panels and armrests, so you won't be purchasing unbacked vinyl for most applications. When you look at vinyl you'll notice that it is manufactured with what is referred to in the industry as a "grain." Grain is texture embossed into the vinyl to imitate the grain of natural animal hides. Some of the most common grain types are Corinthian, Hampton, Madrid, Oxen, Elk, and Sierra. Specialty grains include Alligator, Ostrich, Boa Constrictor, Stingray, Carbon Fiber and Aluminum. All of these grains take on different looks with specialty colors. Many of the most common grains were used as far back as the horse-and-buggy era and are still used today. Landau Vinyl is used for vinyl tops. Even though the new car manufacturers are no longer installing vinyl tops, there are still many early vehicles from the 1950s, '60s, '70s and '80s that have them installed. Landau material is a poly-fleece back unexpanded with additional UV inhibitors added for exterior use. Landau material also has the ability to moderately stretch. 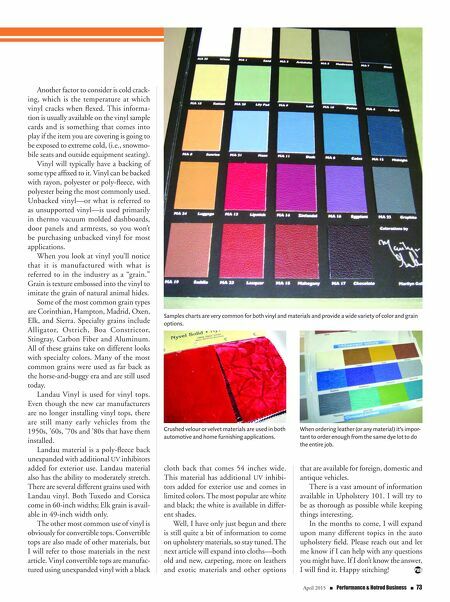 There are several different grains used with Landau vinyl. Both Tuxedo and Corsica come in 60-inch widths; Elk grain is avail- able in 49-inch width only. The other most common use of vinyl is obviously for convertible tops. Convertible tops are also made of other materials, but I will refer to those materials in the next article. Vinyl convertible tops are manufac- tured using unexpanded vinyl with a black cloth back that comes 54 inches wide. This material has additional UV inhibi- tors added for exterior use and comes in limited colors. The most popular are white and black; the white is available in differ- ent shades. Well, I have only just begun and there is still quite a bit of information to come on upholstery materials, so stay tuned. The next article will expand into cloths—both old and new, carpeting, more on leathers and exotic materials and other options that are available for foreign, domestic and antique vehicles. There is a vast amount of information available in Upholstery 101. I will try to be as thorough as possible while keeping things interesting. In the months to come, I will expand upon many different topics in the auto upholstery field. Please reach out and let me know if I can help with any questions you might have. If I don't know the answer, I will find it. Happy stitching! 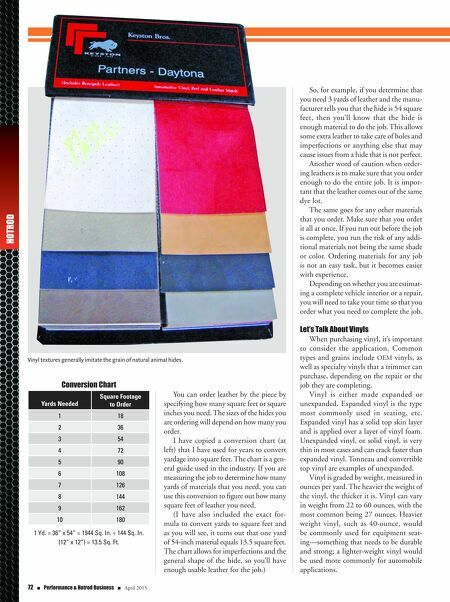 Samples charts are very common for both vinyl and materials and provide a wide variety of color and grain options. Crushed velour or velvet materials are used in both automotive and home furnishing applications. When ordering leather (or any material) it's impor- tant to order enough from the same dye lot to do the entire job.